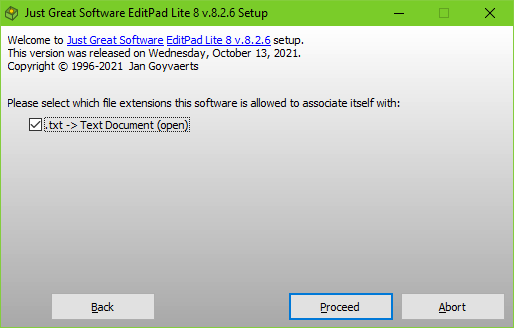 After selecting the installation folders, and Advanced Installation allows the user to prevent the setup package from associating the to be installed application with specific file extensions. Advanced users typically do not like software to take control over popular file extensions. The checkboxes show the extension the setup would like to modify, along with the new description it will receive and the actions (open, print, ...) that will be associated with it. When the file associations have been reviewed, the component selection appears.